The Bear and Star Bar is throwing a Viewing Party with happy hour-priced beer & hand-crafted cocktails and John Cox’s competing specialty dish. THE BEAR AND STAR, the Los Olivos restaurant serving the “Refined Ranch Cuisine” inspired by the Parker family at the eponymous Fess Parker Inn and quickly embraced by locals and visitors, has announced John Cox as a cheftestant in the season premiere episode of Food Network’s hit show BEAT BOBBY FLAY. 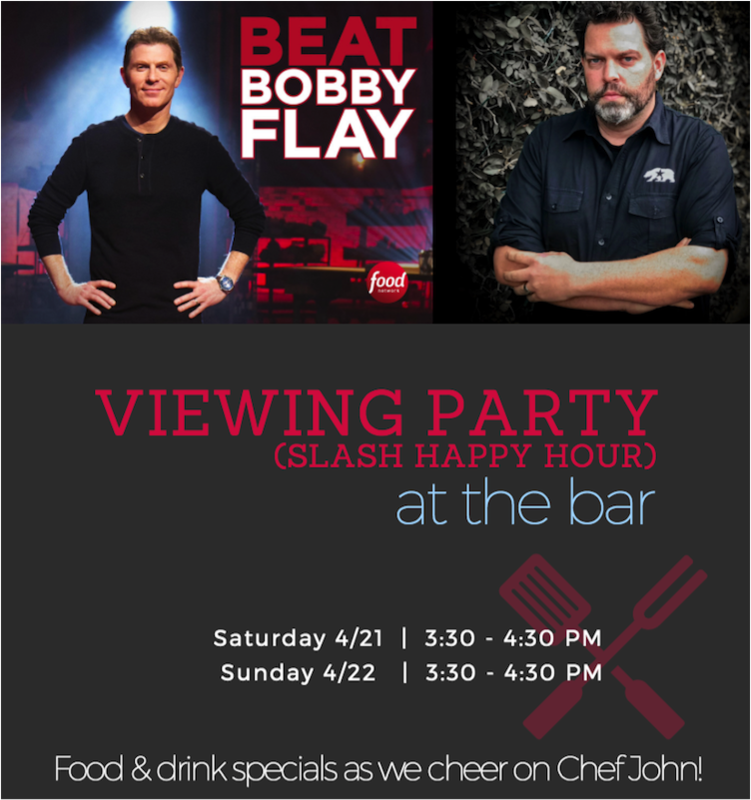 In celebration of that honor, THE BEAR AND STAR presents their BEAT BOBBY FLAY VIEWING PARTY where the public can find out if Chef John makes it to the next level, competing chef knife to chef knife with Bobby Flay. In each episode of BEAT BOBBY FLAY, two talented chefs compete against each other for the chance to Beat Bobby Flay. To get to Bobby, the chefs first face off against each other, creating a spectacular dish with a secret ingredient of Bobby’s choice. Judges Alex Guarnaschelli and Jeff Mauro know Bobby’s strengths and his weaknesses and pick the chef who has the skills to take down Bobby Flay in his own arena. The winning chef gets to challenge Bobby with his or her surprise signature dish. If Bobby goes down, the winner has bragging rights about beating Bobby Flay on national television. The BEAT BOBBY FLAY VIEWING PARTY will take place at the bar at THE BEAR AND STAR and will feature Half-Price Beer & Classic Hand-Craft Cocktails in addition to John’s competing special dish.